A self-declared republic in Somalia asked Ethiopia to reroute its nascent oil and gas exports via a proposed new pipeline, challenging Djibouti’s long-held plans for a conduit. 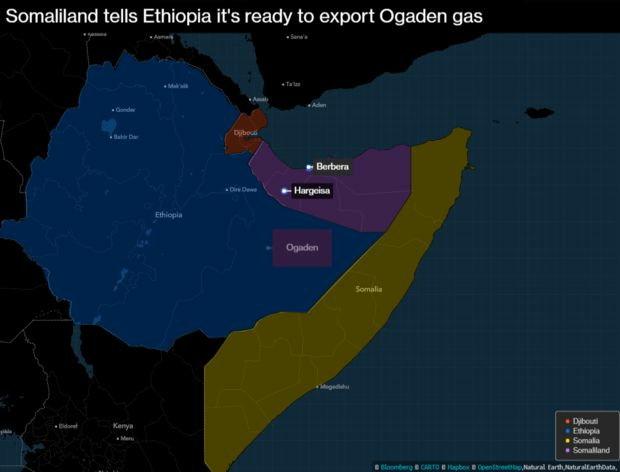 The overture from Somaliland comes as Ethiopia begins exploiting an estimated 8 trillion cubic feet of natural gas and test-drilling for oil in its restive east. It’s the latest bid by the Somali territory, which has sought statehood for almost three decades and plans its own crude output, to leverage its strategic location near the Red Sea to attract major foreign infrastructure projects. “Why not send natural gas and crude oil from the Ogaden basin to Somaliland’s coast at Berbera?” Somaliland Minister of Energy and Minerals Jama Mohamoud Igel said in an interview, referring to the region’s main port. Such a pipeline would be more “cost-effective” at only 400 kilometers (249 miles), rather than the 700 kilometers to Djibouti, he said. Somaliland’s offer is a bold challenge to Djibouti, a tiny former French colony that’s benefited from its location on a global shipping choke-point to host the U.S. and China’s only official permanent military facilities on the continent. It comes as the broader Horn of Africa region sees dramatic changes, with landlocked giant Ethiopia promising multi-party democracy and peace with long-time foe Eritrea. The government will also approach GCL-Poly Energy Holdings Ltd., which is pumping the fuel, over its proposal, Jama said. A partnership between GCL-Poly and the closely held Hong Kong-based Golden Concord Group signed five production-sharing agreements with Ethiopia in 2013 to explore in the Ogaden basin. Ethiopian Prime Minister Abiy Ahmed has said gas exports to Djibouti will begin in 2021, two years later than initially planned, and bolster what’s already Africa’s fastest-growing economy. The chairman of Djibouti’s ports authority, Aboubaker Omar Hadi, said he wasn’t aware of the offer, but GCL-Poly and his government had already signed the contract for a pipeline. “Business is about competition,” he said by email. An Ethiopian spokesman for the mines and energy ministry, Mikahil Mengesha, referred requests for comment to an official at the institution’s Petroleum Licensing & Administration Directorate, calls to whom didn’t connect. Tedla Minda, a senior accountant at GCL-Poly’s Ethiopian branch, said he would forward emailed questions to the general manager. Berbera in Somaliland is already the site of a United Arab Emirates military facility, as well as a port being built by DP World Ltd., which the Dubai state-controlled harbor operator says will help boost trade flows to the U.A.E. Somaliland, which is bigger than the U.S. state of Florida, is also planning its own oil production. Genel Energy Plc, an oil company founded by Nathaniel Rothschild and ex-BP Plc Chief Executive Officer Tony Hayward, is preparing to drill as many as three wells in the territory’s east, where it has production-sharing agreements, Jama said. Genel will start drilling at one well in the fourth-quarter of 2019, near Burao in the Togdheer region, according to Jama and Genel’s communications head, Andrew Benbow. “There is oil for sure, but they have to come to know if this is viable for commercial business,” Jama said. RAK Gas LLC of the U.A.E., which has production-sharing agreements for two blocks south and east of Berbera, is in talks with Genel over co-drilling arrangements, according to Jama. The company didn’t respond to two emailed requests for comment sent to an address on its website. Three Chinese companies will explore with local partners for jade in southeast Berbera, between the Genel and RAK gas blocks and near the U.A.E. base, according to Jama. He said unidentified Canadian, Chinese, Norwegian and British companies are interested in exploring three offshore blocks on the approach to the Bab el-Mandeb, where the Red Sea meets the Gulf of Aden. Chinese and British companies are also in talks over two further onshore blocks at Somaliland’s border with Ethiopia.